Hilton Berlin offers you the opportunity to rent bicycles on your romantic escape. 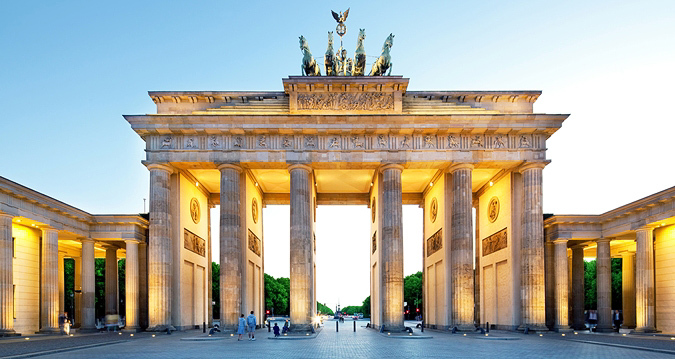 You will explore the city on your own while soaking up the atmosphere, sights and sounds of Berlin, Germany. Create many honeymoon memories on this exciting honeymoon adventure! 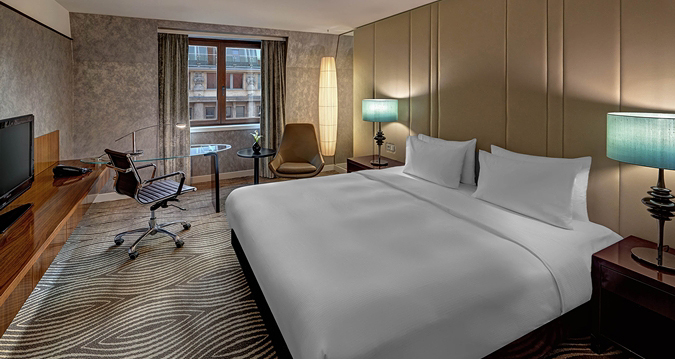 You will indulge in the King Guestroom on your honeymoon at Hilton Berlin. Your romantic retreat is beautifully decorated and features fine furnishings, including a work desk and a 32-inch TV. This guestroom boasts a mini bar, a king-size bed with luscious linens, bathrobes, and a bathroom with lavish amenities. From the comfort of our King Guestroom, you will enjoy delightful courtyard or street views. On your honeymoon you will be pampered with a stay in the King Guestroom Domeview. This stylish room is beautifully decorated and features fine furnishings including a work desk and a 32-inch TV. Your soothing sanctuary boasts a mini bar, a king-size bed with luscious linens, bathrobes, and a bathroom with lavish amenities. 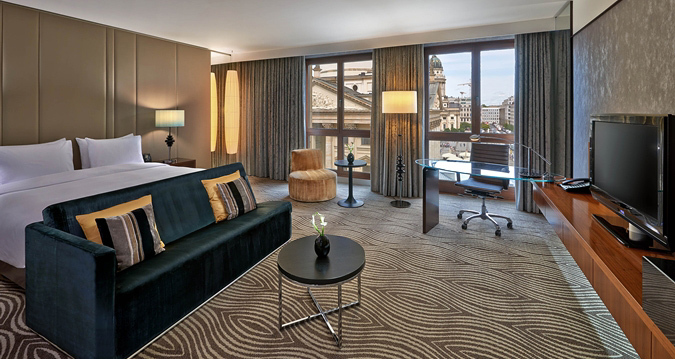 From the comfort of our King Guestroom Domeview, you will enjoy a stunning view of the historic Gendarmenmarkt Square. 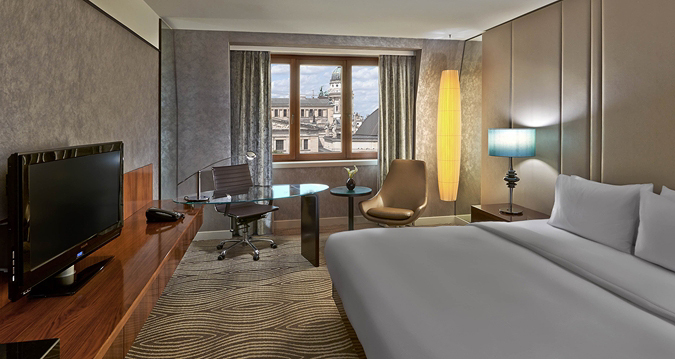 Your romantic honeymoon at Hilton Berlin will be enhanced with a stay in the King Deluxe Room. This chic room is beautifully decorated and features fine furnishings in the separate seating area including a sofa, work desk and a 32-inch TV. Your honeymoon haven boasts a mini bar, a king-size bed with luscious linens, bathrobes, and a bathroom with lavish amenities. From the comfort of our King Hilton Deluxe Room, you will enjoy delightful courtyard views. The Junior Suite Dome view promises you an exquisite honeymoon stay at Hilton Berlin! This spacious sanctuary is beautifully decorated with stunning designs and fine furnishings in the separate living area with a sofa, a 32-inch TV, and a work desk. You will enjoy access to the Executive Lounge, which includes complimentary breakfast and refreshments. Our junior suite boasts a mini bar, a king-size bed with luscious linens, bathrobes, and a bathroom with lavish amenities. In the comfort of our accommodations, you will take in the breathtaking views of the historic Gendarmenmarkt Square. A stay in the Corner Suite Domeview will be a lovely wedding gift for your honeymoon at Hilton Berlin. This stunning sanctuary promises you access to the Executive Lounge, which includes complimentary breakfast and refreshments. Our spacious suite boasts fine furnishings in the separate living area with a 32-inch TV, a mini bar, a king-size bed with luscious linens, bathrobes, and a bathroom with lavish amenities. 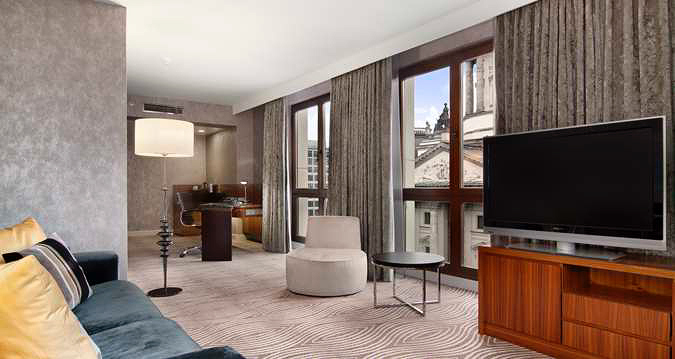 You will enjoy breathtaking views of Gendarmenmarkt Square from large windows of this spacious corner suite. 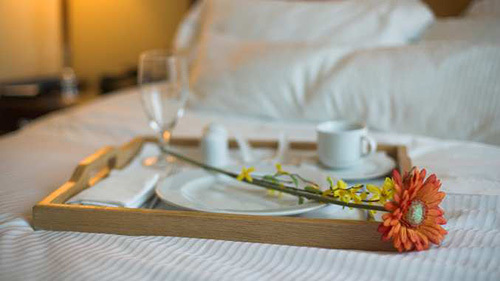 With your lovely wedding gift, you will experience pure luxury with room service for a breakfast in bed, a sumptuous lunch, a private dinner or cocktails for two. You will choose from a menu featuring a variety of selections to make our honeymoon that much more memorable from the comfort of our room! At Dom Curry, they serve a tempting range of grilled sausages with homemade curry ketchup and fries as well as refreshing drinks. You will enjoy a Berlin specialty, the Currywurst, at this centrally located diner, located opposite Hilton Berlin. During the spring and summer, you will sit on the terrace on Gendarmenmarkt and enjoy timeout from the bustling city life. 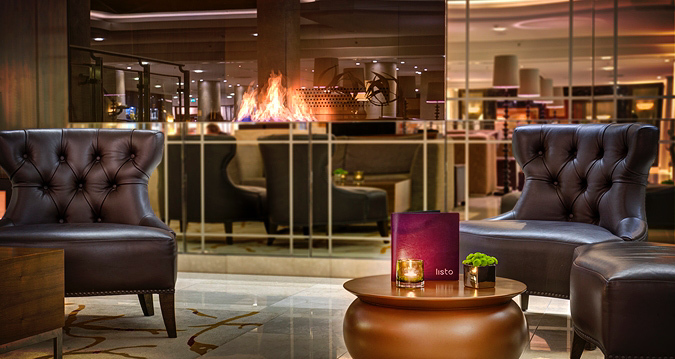 You will take delight in a cup of coffee at the buzzing Listo Lounge of the Hilton Berlin hotel. 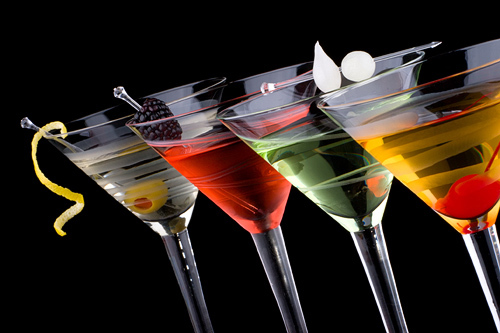 Here, you can indulge in a burger, Caesar salad or club sandwich, then sit back with a cocktail and enjoy the live music. On your honeymoon you will take in the views of the Gendarmenmarkt from the Hilton Berlin hotel as you sit down to breakfast or enjoy the Sunday Lunch at restaurant Beletage. 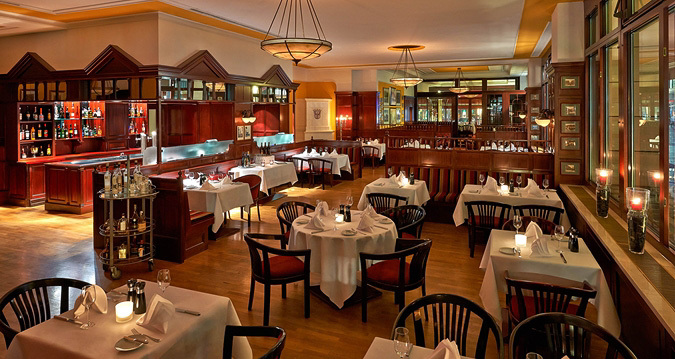 This flexible venue offers a separate buffet area and two connecting meeting rooms, making this Berlin restaurant suitable for all kinds events. Whether you are planning to indulge in lunch, brunch buffet, party or gala dinner, the Restaurant Beletage is the perfect choice. At Restaurant Mark Brandenburg in the Hilton Berlin hotel, you will sample regional favorites as you enjoy views of the Gendarmenmarkt. This Berlin restaurant is certified by the European Centre and has a suitable menu for guests with allergies. Located in the city center of Berlin, just a short drive from Berlin’s two major airports, Hilton Berlin oﬀers beautifully designed accommodation within walking distance of the city's major attractions. Placed on Berlin’s most beautiful square, the historic Gendarmenmarkt, the hotel is just moments from the French and German Cathedrals and the concert house. You can explore on your own by renting bicycles and pick up some honeymoon keepsakes in their gift shop. Take in fabulous views over the German Dome on the Gendarmenmarkt from a variety of settings in our hotel, including Beletage and Mark Brandenburg restaurants, several rooms, and the Executive Lounge. 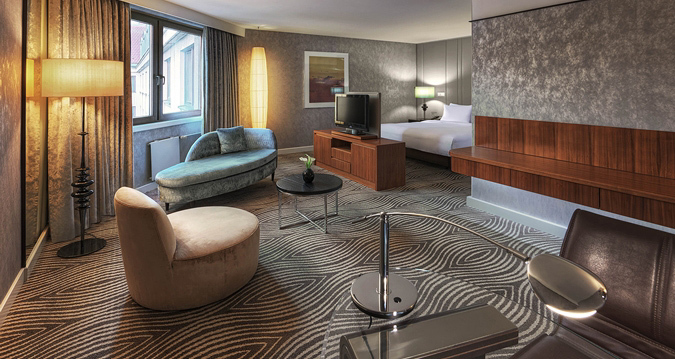 Enjoy excellent dining options and feel at home in a modern guest room or suite at Hilton Berlin. Stay in an Executive Room and enjoy access to the Executive Lounge with complimentary breakfast, snacks, drinks and WiFi. Discover complete relaxation after a long day at the LivingWell Health Club. 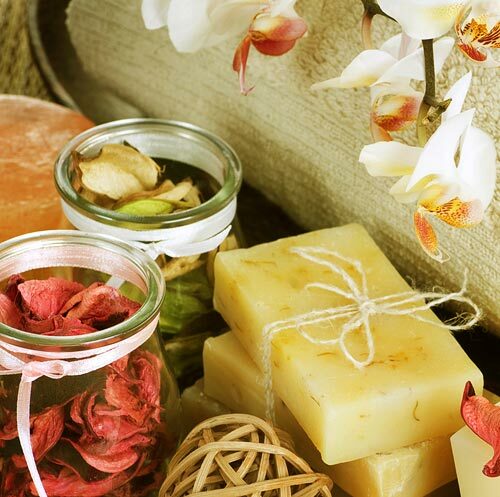 Our spa encompasses a range of facilities and services to help you focus on well-being and simply unwind. Select from a range of treatments, re-energize in the spacious fitness center with the latest fitness equipment, take a dip in the indoor pool or unwind in the sauna and steam room facilities. With your wonderful wedding gift, we will create unforgettable honeymoon memories with this extra hotel credit! 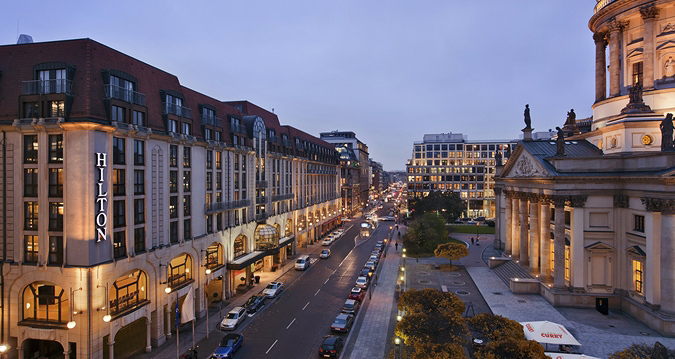 Hilton Berlin is located on Berlin’s most beautiful square, the historic Gendarmenmarkt. You will have the opportunity to visit the French and German Cathedrals, the concert house and Berlin’s major attractions such as the Berlin Wall, Brandenburg Gate, Check Point Charlie and the Reichstag, and lots of shopping and nightlife. Pass by our concierge and rent bicycles to explore the city on your own! In the comfort and luxury of one of their lavish accommodations, you will experience pure indulgence. 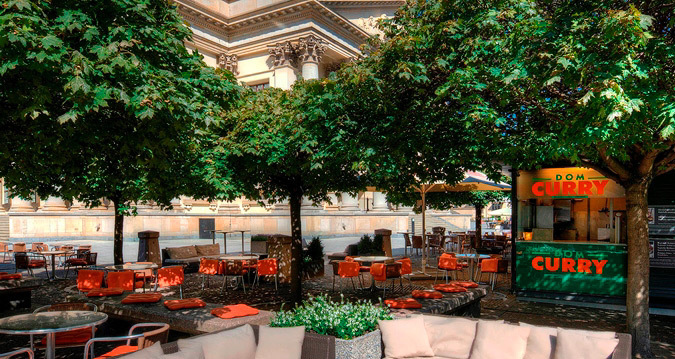 You will sample regional cooking with a modern twist in Mark Brandenburg Restaurant, try Berliners’ favourite food al fresco, the Currywurst or curried sausage directly on the terrace of Dom Curry, or linger over drinks in the Lobby Lounge. In our LivingWell Health Club you will indulge in pure relaxation or stay fit in our newly renovated gym with latest fitness equipment. Choose from a range of relaxing spa treatments. Hilton Berlin will enhance your honeymoon with special touches, impressive amenities and warm hospitality. 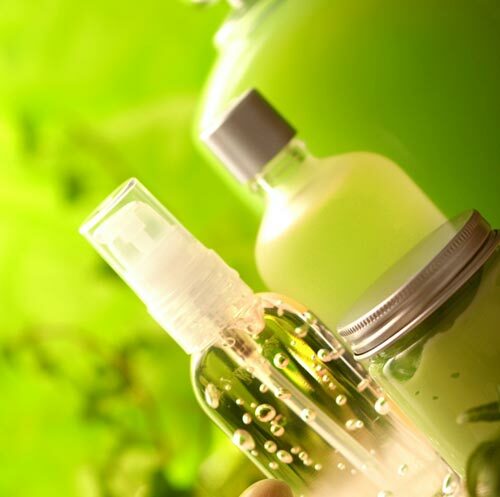 In the tranquil settings of the LivingWell Health Club Berlin, you will take delight in the Organic Aromatherapy Facial. 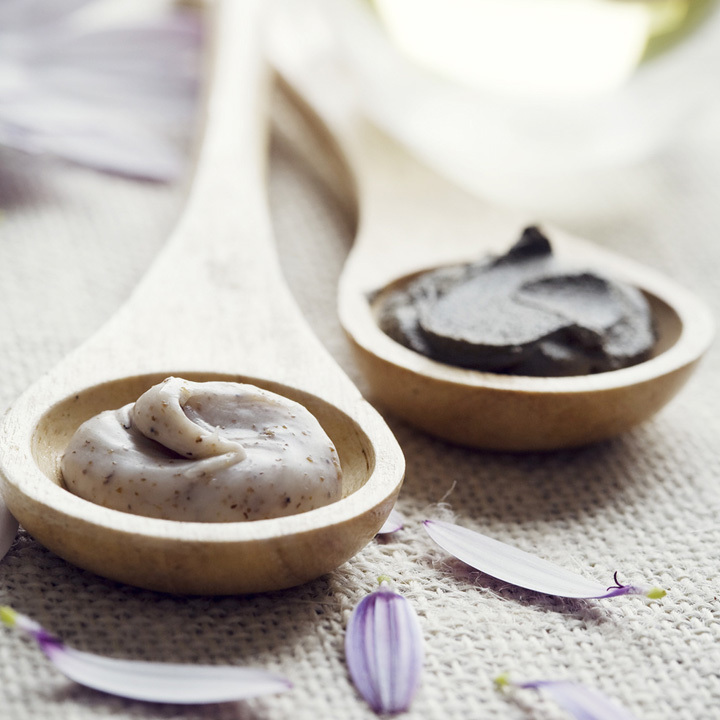 This gentle, soothing facial with pure organic essential oils will leave your skin feeling refreshed and rejuvenated. 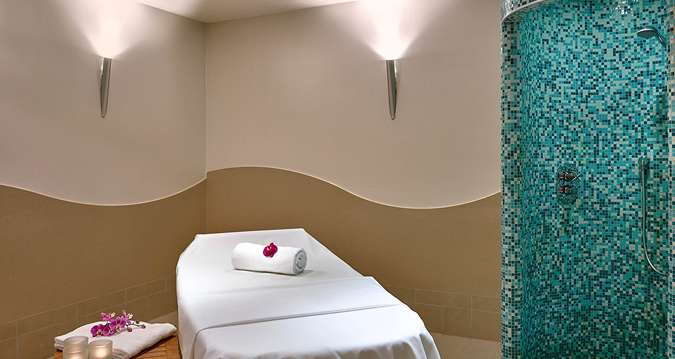 You will be pampered with the Replenish & Polish body treatment at LivingWell Health Club Berlin. This is a two-step gentle polish rich in botanicals and wild chamomile to hydrate and soften my skin. Using an all-natural, live Spirulina Algae, this seaweed treatment imparts essential vitamins, minerals and protein to nourish and revitalize the body. The body is wrapped for 20 minutes to soak up essential elements from the Spirulina Masque. The application of Ginger Bath & Body Oil finishes this purifying and firming treatment. Very effective when used as part of a slimming or nourishing program. On your honeymoon in Berlin you will be pampered while your nails are nourished with the Wellness Manicure. You will receive a nail shaping followed by cuticle maintenance, a hand massage and an application of your favorite nail polish. LivingWell Health Club Berlin promises you an indulgent pedicure in the serenity of the spa. Your feet will be immersed in a foot-soak before you receive a cuticle trimming and nail filing. Next, your feet and shins will receive a soothing massage followed by an application of my favorite nail polish. You will take delight in a luscious Chocolate Rasul Bath experience on your romantic honeymoon. In the serenity of LivingWell Health Club Berlin you will soak in a bathtub filled aromatics to experience pure decadence! 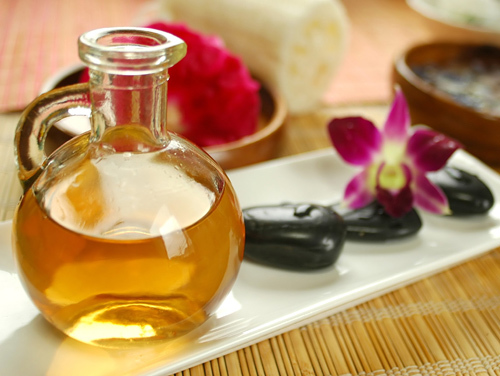 At LivingWell Health Club Berlin you will take delight in the Aroma Oil Massage. In the tranquil settings of the spa, you will receive a classic, Swedish massage with organic aromatherapy body oils. 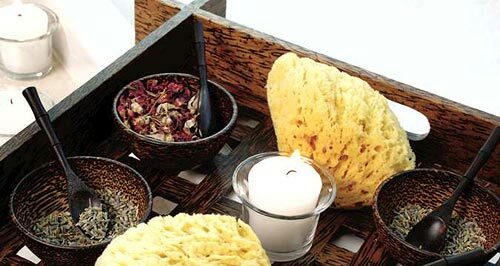 To customize your massage experience, you can choose from a variety of invigorating and fragrant blends. The Hot Stone Massage will be the perfect wedding gift for your honeymoon in Berlin, Germany. 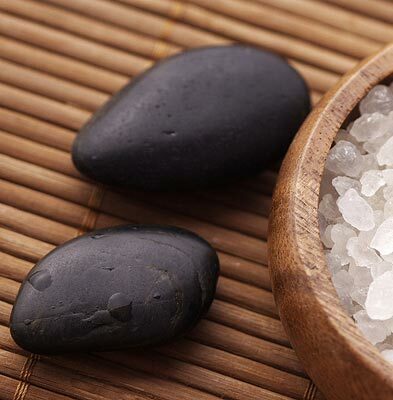 Warm lava stones will activate the blood circulation and will relax your muscles and recharge your energy. With your lovely wedding gift, we will indulge in the Relaxation for Two on our romantic honeymoon. We will enjoy togetherness and treat ourselves to a 20 minute Swedish Back Massage followed by Chocolate Rasul treatment. Our special spa experience will end with a glass of sparkling wine for each of us.